Thanks to Webrcon, the final 2014 FCRA (Fair Credit Reporting Act) and FDCPA (Fair Debt Collections Practices Act) complaint stats are in. FCRA complaints remained steady compared to 2013 with 2,327 in 2014. 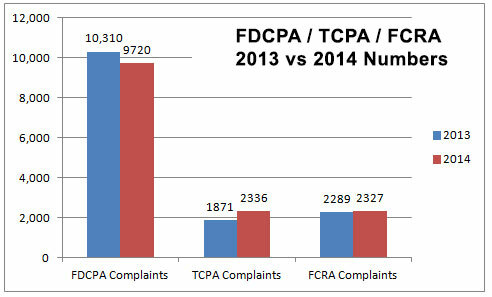 FDCPA complaints dropped slightly from 2013 with 9,720. With just over 12,000 yearly FCRA and FDCPA complaints, the demand for qualified and competent expert witness’s remains high. True specialists in FCRA and FDCPA litigations are limited. I welcome your call to discuss your case. Credit Damages – Have They Occured?